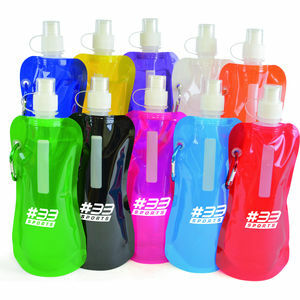 Roll up water bottle and carabiner attachment with pull top drinks lid. Reusable, great value pouches with a fab print area to promote your company or message. Super handy, folds away when empty, stands up when filled with liquid. Carabiner clip to attach to a belt loop or sports bag. This item is also BPA free! !